Upgrade your home office to make it organized and beautiful. Begin with these home office organization tips and you’ll be more efficient when you work from home. Where do you work in your home – is it your kitchen? Your bedroom? Or do you have a home office set up? Creating a space – no matter the size – to work from home can dramatically improve your efficiency. 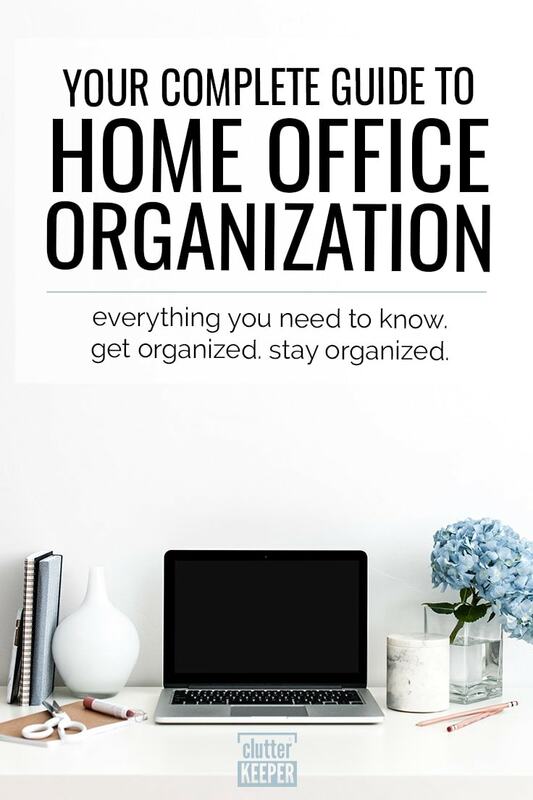 Let’s look at everything you need to know to have an amazing home office organization plan. So, you know you want to create a home office – either a brand new one or redo what you have – but where do you even begin? These tips will get you started on a home office that will increase your efficiency, help you think clearer, and give you the ability to accomplish more. The first place to start in creating or organizing your home office is to decide the function. Plan for all possible uses for your area so you can organize it best. After you know how the space is going to be used, you can make sure you have a place for all these functions to happen. For example, if you think your children will use the home office for their homework, make sure there is enough desk or table top space for them. If more than one person is going to be using it, you can also plan ahead and give them places to store their papers and office supplies. After you decide the functions of the room, you need to establish who is going to use it. Will this room be open for everyone in the family? Or will it just be used for working from home or managing family finances and plans? Figuring out who is going to use the space will also help you create some dialogue with everyone and set the rules for keeping it clean. Home office spaces are notorious for disorganization. Papers and office supplies (and sometimes even food stuff) stack up on top of each other, especially when more than one person is using it. So to prevent chaos, decide who is going to use it and what their responsibilities will be, and where their space in the room is. Now that you know the room’s function and who is going to use it, it’s time to draw a sketch of where you think you’ll put your furniture. When you buy your furniture, don’t just go for beauty, but keep function in mind too. Use your space wisely and buy furniture that will store office supplies and papers and anything else you use daily. The best way to do this is to measure your room. Then, grab a sheet of plain white paper and sketch the room with measurements. Next, write down the measurements of the furniture you want and the fun part can begin! Play around with the room, rearrange the furniture and figure out where you are going to place everything before you buy it. When you are planning a design layout, keep the functions you decided in the first step in mind. If you know that more than one person will be using it, prepare enough space for them to accomplish their tasks. Next, create a maintenance plan – how will you keep it this clean? This is a very personal thing and depends on your schedule, who uses the room, and how organized you are already. At minimum, it will be helpful to schedule at least one day each month to go through and reorganize all the papers and evaluate your storage ideas. Do you need more places to keep things? What can you throw away or donate? Maintaining an orderly and organized home office is a lifestyle choice that requires attention. Keep changing things up and making your office work for you. If the bedroom is where we sleep and the kitchen is where we eat, then your home office may be the nerve center of the house. If you work from home your home office may be where all of your work-related files and work materials live. If you don’t work from home, it may just be a place where all of your family’s finances and documents are dealt with. No matter what the use of your home office, we understand how much work happens in the office. This is why it’s so important to get this room organized and ready for whatever comes through that door! The first step to organizing any space is to get rid of things that you don’t use, or don’t plan to use in the future. Since our home office space is where we keep all of our documents and other office supplies, it’s easy to let them sit there for years after they are no longer needed. Start by sorting through all of your office items and put them in either a keep, donate, shred, or trash pile. Once you have sorted your items into the above categories, it’s time to take those items and move them to their new homes. For your trash pile items, go ahead and throw them out. The shred items should go in a box to be shredded later, and your donated items can be put in a box and taken to your local Goodwill or wherever you plan to donate those items. For the items that remain, sort them into piles based on item type. For example mail, paper, writing utensils, office supplies, etc. Once you can see everything in your office organized by category, it will be easier to organize. While you have everything removed from the desk and shelving units, take this time to clean it out. Wipe down and dust your surfaces with a microfiber cloth, and take the time to clean out these spaces. Wait to vacuum or mop your floor until everything you’ve sorted has been put away. Now that you’ve cleaned your work area and organized your items into piles, it’s time to find a home for your belongings. Decide if the organization system you already had in place was working well, or if you need to come up with something new. If you do need a new storage system, like a filing cabinet, take a look at the items you are preparing to store, and measure your storage area before you buy an organization system for that space. Now that you have determined where things will go, it’s time to put everything back. As you begin to put items away, you may find that you need more storage systems, new storage systems, and may need to move things around. Try to keep things simple and put items where you would like them to go, then try to find a better storage solution if the one you’ve chosen doesn’t work. Be flexible with your storage solutions and know that you may need to change them down the road. Organizing your home office can be tricky, especially if you’re working from home. However, with these tips, you’ll have a cleaner and more organized space in just a few steps. How much space do you have in your home to work remotely? Maybe you want to create your first home office and don’t know where in your house to put one. Thankfully, you can create a space built for focus and efficiency, no matter how much space you have. Here are some fantastic ideas for rooms of all sizes. If you only have a corner or even a small closet, you can still have a useful and lovely home office workspace. Susanna Hawkins has a very inspirational Instagram feed and this tiny desk space is genius. You don’t need a lot of room for a home office, you just need to use the space you have very well. If you notice things that are causing disarray, store them somewhere else. There is even room on the walls for more command station type furnishings – like a calendar – if you need it. Trying to mesh where you work with where you sleep is going to be a challenge, but it can be done. Amy and Athina from Topology Interiors began their successful interior decorating business from their homes. This is the picture from the bedroom where Topology started. The secret to working from your bedroom is to use warm textures (like that shag blanket) on the furniture so it looks like it fits in the bedroom. You also want to keep the work area as clean as possible so you can relax when the work is complete. If you have an extra room in your home that you can turn into a workspace, then put your entire heart into decorating it. Here’s an amazing picture for inspiration. Of all the home office pictures on Instagram, Julia’s office is probably the most envious. With enough work and design talent, the place you work can also be your favorite room in the house. Are you ready to turn your workspace into an efficient home office? Here are 8 tips that will whip your room into shape. Take all the papers on your desk, and decide which bills and other things you can eliminate. Banking, traveling, even school – almost everything is going paperless. Storing everything electronically will make it easier to find when you need it. It also creates more room for you to plan and dream and work at your desk. When you remove all the loose papers from your desk, you will be amazed at how much simpler life is and how much easier it is to keep it clean. If there are some things that you don’t feel comfortable going paperless with, that’s ok. You can organize your home office files in a way that keeps them put away and keeps your area tidy. Find a storage solution that fits in your space. Whether that means you get a filing cabinet or just a small filing box, there are lots of things out there that will let your store your files. After you know where you are going to file your papers, organize them. You only need to keep important papers for about a year. One idea is to put a reminder on your calendar to go through your papers annually and shred outdated documents. Or you can create a filing system that is organized by date, so when you reach the next year, you know to shred the outdated papers. Another big pain in home offices are all the charging cords that run amuk on desktops and bookcases. Label every single cord so you know to which electronic it belongs. Put the extra cables into a plastic tub or box. There are lots of cute and useful storage solutions for electronic cords and cables. You could even invest in wireless charging docks. Why are you keeping your extra books? Choose to display the books that you use or that add to the decor of your home office. When you bring something new into your office, decide if you have room to store it or if you need to remove something you don’t use first. As your life changes, your home office should change too. Maybe you aren’t using a filing cabinet anymore – remove it. When every item in your office has a purpose, you will be more likely to keep it organized. If your home office is going to be used by multiple people, creating zones will establish boundaries and help everyone keep their own areas picked up. There are lots of fantastic ideas for how to share a home office space with kids and spouses. If you are sharing an office space with just one other person, consider putting a desk in the middle of the room and placing the computers back to back. Give everyone their own calendar and space and let them take ownership of keeping their part of the room organized. If you have the space, install either a small closet or even a towel rack. Use hanging organizers to easily store the items you need within arm’s reach. Protect your desk from becoming overrun by office supplies. Organizing office supplies is a vital part to keeping your home office in top shape. Hanging organizers have individual pockets so you can store all your office supplies in separate pockets. You can also label them if you want to give each member of the family a different one. It’s amazing how our mood affects our efficiency and drive, but it’s true! So hang up some inspirational prints around your desk and decorate in your favorite colors. Make your home office all about you! When you have a lovely place to work, you will be more motivated to focus and accomplish more. There are home offices in every budget. So if you are trying to save money, look for ways to upcycle wood crates or wood pallets. If you want all brand new furniture, decor, and flooring, the price for a home office could jump into the thousands. This is feasible with a little budgeting or just buying new things for your office piece by piece. Start dreaming and then begin doing! Your home office organization solutions are here. Everything you need for a dreamy workspace is easily attainable. Just do a little planning and then put together a home office that will increase your productivity and focus. Now that you have a really organized office, are you ready to tackle other rooms in your home? Here on Clutter Keeper, there are articles to help you through every room and challenge. Kitchen Organization Tips – Here you’ll find everything from a complete guide to super quick tips. Laundry Room Organization Ideas – Find answers to all your questions and solutions for your laundry room struggles. Cleaning Tips – As you organized, you can also deep clean. Find DIY cleaning solutions, hacks, and other tips that will make your job a lot easier.